The medal at the right was designed by T. H. Paget to mark the installation of the Prince of Wales as Master of the Honorable Company of Master Mariners. The prince set for Paget to prepare the coins of his reign as Edward VIII, but the right-facing portrait demanded by tradition displeased the new king, whose hair was parted on the left. Study of the pattern at left gives insight into his objections. Edward was born on June 23, 1894 at Richmond Park, Surrey. He was christened Edward Albert Christian George Andrew Patrick David. As a youth, he exhibited an independent will, and was frequently in conflict with his iron-willed father, King George V. The king was a harsh, conscientous ruler, who insisted that his children make appointments through a page before approaching their father. Edward confessed many years later that he was in mortal fear of his father, and this loveless upbringing may have had a profound effect of the history of the 20th century. While Prince of Wales, Edward toured the Commonwealth and the United States, receive by enormous, adoring crowds. At this age, having set up his own household at Fort Belvedere, the Prince soon set the world of gossip buzzing about his distinctive life style. His views of the role of a monarchy in a depression world gave alarm to many vested interests, and his original thinking toward European problems, particularly the Fascist dictatorships, caused alarm in some quarters. His infatuation with the still-married Wallis Warfield Simpson was another concern. Although British custom led the press to consciously ignore the prominent place she occupied before his ascension to the throne, the prince’s relationship to this much married woman was deely distressing to those near the royal family. King George V, the Archbishop of Canterbury and others advised the Prince to modify his life-style, to no avail. Edward became king on Jan. 20, 1936 following the death of his father. He was to occupy the throne for less than a year, and his reign was one of the most severe trials that the British monarchy has ever experienced. His decision to marry Mrs. Simpson, whose husband obligingly stepped aside, rocked the British government. Despite the support of such figures as Winston Churchill, the new ruler allowed himself to be backed into a tight corner by the establishment, led by the lackluster prime minister, Stanley Baldwin. Without informing his close friends, the king decided to abdicate on Dec. 10, in order to marry “the woman I love.” He spent part of 1940 in Spain, where he was approached at length by German agents, before leaving the Old World to serve as Royal Governor of the Bahamas. His term of office in Nassau was marred by the spectacular murder of American-born mining millionaire Sir Harry Oakes, and the unfortunate habit of his Duchess of dating her letters from “St. Helena” or “Elba” did not endear the couple to the Bahamians. 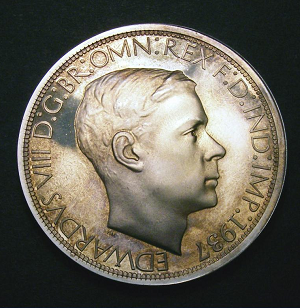 Numismatically, the brief reign of Edward VIII was to generate a tremendous interest. Coins bearing the king’s name were issued in East and West Africa, Fiji and New Guinea. All of these pieces were holed, and bore no portrait. The Indian states of Kutch and Jodhpur also struck coins of the new ruler. No regular circulation coins were issued bearing the king’s portrait, although dies were prepared for most denominations in the United Kingdom, numismatic ambassador Read found. The full story of Edward’s coinage was unknown until 1973, when G.P. Dyer, librarian and curator of the Royal Mint, published his study, The Proposed Coinage of King Edward VIII, Read advises. The history of the new king’s coins began while he was still Prince of Wales. In 1935, Edward was elected Master of the Honourable Company of the Master Mariners, and a medal was struck for the occasion. The medal bore a portrait bust of the Prince, designed by sculptor Thomas Humphrey Paget. The prince was greatly impressed, and Paget was invited to prepare the new coinage after Edward became king. A snag developed almost at once. British tradition dictated that Edward’s portrait should face right on the coins, the opposite from his father. Edward objected that his left side showed the stronger features, and his hair parted there as well. The designer tried to get around this by the innocent deception of showing the king’s left side as his right, but the monarch was not amused. As a result of the ruler’s strong feelings, the dies were engraved with the left-facing profile. One other artist was invited to attempt a royal portrait, William McMillan. His stern treatment of the king’s features caused his designs for the United Kingdom coins to be rejected. 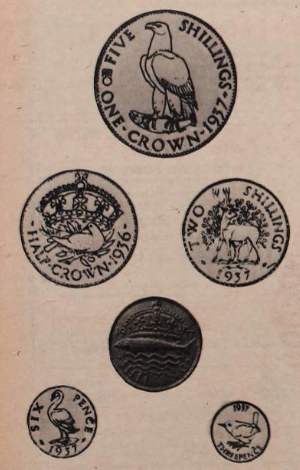 Although the British coins had thoroughly been redesigned in 1927, the new king expressed a wish for new reverses. In conformity with his decidely modern views, several novel approaches were explored. A whole series was designed with a wildlife theme, inspired by the very successful Irish designs of 1928. The king’s beasts provided material for these sketches and the pattern for the new coinage of Edward VIII. The eagle drew disapproval as reminiscent of the fascist emblems on the continent, but the wren survived in the next reign, moved from the small silver three pence to the bronze farthing, where it was to remain until 1956. The swans of England are legally royal property, as is each sturgeon that is caught. The stag reminds us of the Robin Hood tales of deer-poaching. The “king’s beasts,” the creatures traditionally identified with the royal house, were used as subject material. Wilson Parker designed this set, Read found. A dove, stag, and swan graced the halfcrown, florin and six pence. Swans in Britain are all royal property, as is each sturgeon which may be caught. A striking sturgeon under a royal crown was to have formed the shilling’s reverse. A handsome and commanding sea eagle was to appear on the five shilling crown, but this actually helped to scuttle the whole wildlife idea, as it reminded the coinage committee of the Nazi and Fascist eagles then so obvious on the continent. One of the sets was to survive, however. The wren which artist Wilson Parker planned for the tiny three pence was to appear later on the bronze farthing, and saw active service through the 1950s. An alternative set was prepared by designer Kruger Gray, using more conventional heraldic themes. The crown, florin and the two shilling designs of this series saw active circulation in the next reign, but a heraldic banner half crown and ring designs for the six and three pence did not get through. The proposed gold coins featured the familiar St. George and dragon originally modelled by Benedetto Pistrucci in the early 19th century. One novelty here was the desicion not to strike a half sovereign. 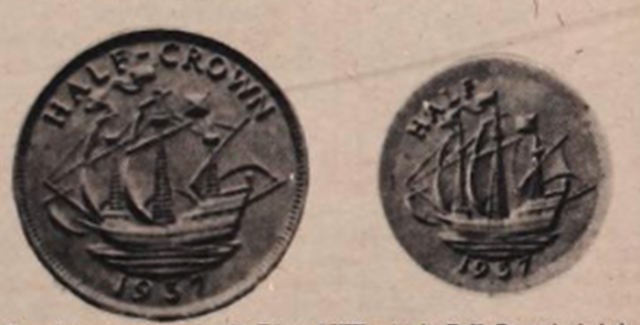 In addition to the migration of Parker’s wren from three pence to farthing was the Golden Hind, Sir Francis Drake’s flagship, from Paget’s halfcrown to the half penny, where it remained until decimalization many years later. Particularly interesting to numismatist Read was the saga of the new Edward VIII nickel brass three pence. The 12-sided was planned as a replacement for the inconvenient silver three-pence and bore a seaside thrift plant designed by Madge Kitchener. Several specimens of the new coin left the Mint for inspection by vending machine interests, and these were to become the only portrait coins of Edward VIII to reach the public. The colonial and Commonwealth coins at this time were of two basic types, an uncrowned effigy for the home coinage, and a crowned bust for the dependencies. After being offered the choice, the advanced dominions, Canada, South Africa, New Zealand and Australia opted for the uncrowned type. Since the crown covered the part in King Edward’s hair, this design problem was solved for the colonial coins. McMillan and Percy Metcalfe prepared several different crowned portraits, but none of these saw circulation. After the abdication of the king, several of the proposed coin designs were transferred to the new ruler, George VI. T.H. Paget was specifically recommended by the ex-king, who did not wish any professional loss for those who had worked with him in his brief reign. 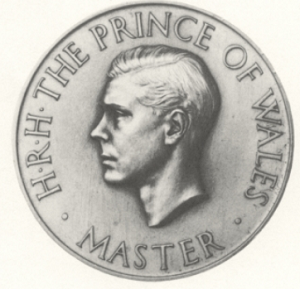 Clay Read also delved into the history of another numismatic enigma: the crown-sized pieces offered for sale in 1937 and after, which carry an uncrowned bust of Edward VIII and a variety of reverses purporting to represent several British dominions and colonies as well as the home country. These pieces were originally struck by London’s medallic firm of Pinches and Co. Designs included two for Britain, one each for Bermuda, Australia, New Zealand and Ceylon. Recently, additional types, Canada and British West Africa, have appeared. Frequently and erroneously referred to as patterns, they were sold for years as a limited issue. It is apparent now that limited meant to the number that could be unloaded on collectors. The numismatic saga of Edward VIII cloesly parallels the stirring events of his reign and abdication, Clay Read has discovered. Originally published in the December 18, 1974 edition of Coin World and reprinted here with permission of the publication.